WE ARE OFFERING A PRICE FREEZE ON OUR SILKS PREMIER COURSE FACING PAVILION! BOOK NOW TO ENJOY A SIZEABLE SAVING! Eventmasters are delighted to offer official Chester May Festival corporate hospitality on Chester City Day. This fabulous day of racing regularly attracts the very best trainers and horses to Chester Racecourse for one of the best meetings of the season. The superb fixture opens in style with the MBNA Chester Vase, which celebrates it’s 101st renewal in 2019, taking centre stage. The race is traditionally regarded as one of the major trials ahead of the illustrious Epsom Derby and sees the season’s star colts put their credentials to the test in front of a packed crowd. Our Premier Course Facing Pavilions offer you the chance to enjoy a day of VIP luxury at this outstanding flat racing event. Each facility located inside the final furlong has an exclusive garden area and guests can enjoy all of the action from a private viewing area along the running rails. 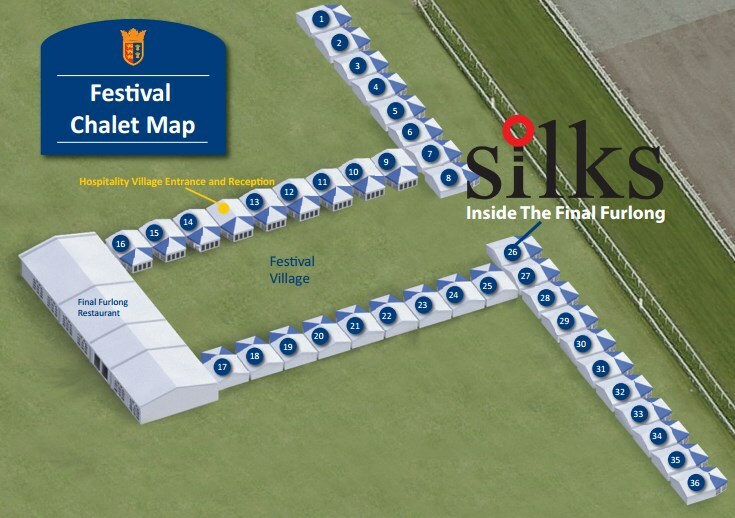 Located within the official Hospitality Village and exclusive to a limited number, our Premier Course Facing Festival Pavilion hospitality facility includes an exclusive garden area with private viewing along the running rails, giving guests an excellent view of the final furlong. Each facility located inside the final furlong has an exclusive garden area and guests can enjoy all of the action from a private viewing area along the running rails. Please note: We are offering a price freeze on our Silks Premier Course Facing Pavilion. Our Chester May Festival Premier Course Facing Pavilion offer guests the very best hospitality on Chester City Day and also provides stunning views of all the racing action inside the final furlong. Below we have posted a map showing the prime location of our facility. The M53, M56, M6 and A483 are all in close proximity to Chester providing excellent links from Liverpool, Manchester, North Wales and the south of England. The Racecourse is signed from all the major routes into Chester on racedays. The station is 20-30 minutes walk from the Racecourse through the picturesque Chester city centre. Merseyrail now operates four trains an hour between Liverpool and Chester Monday to Saturday up until 18.30pm, then a half hourly service. The Premier Course Facing Pavilions offer guests the ultimate hospitality experience at the Chester May Festival – with breathtaking views, exquisite dining and first-class serivce you are sure to enjoy a memorable day. Eventmasters were extremely helpful all the way from booking to post-event. I was really impressed with the facilites and hospitality. plus we came out on the day and came out with a few winners which was a bonus! Had a really great time at the Chester May Festival with my clients. The weather was spot on and the hospitality service was completely flawless. We will be re-booking. 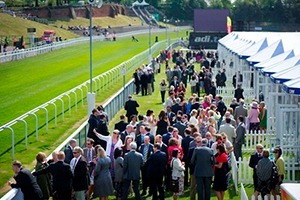 We have a dedicated page where you can view, download and print all of our event information for our Chester May Festival 2019 hospitality packages.